Behold — at long last, the answers to the Q&A I’m doing with AnonymousA! Make sure to check her blog today for another Q&A post. L: I like writing fantasy and adventure. A: Same as Loren, although I’ve tried my hand at historical fiction. What is your biggest writing pet peeve? L: When all my characters have the same way of speaking. It’s hard to give them all their own voice. A: When I put ‘Although,” too much. It just makes me feel wrong. What is your writing process? When you get an idea, what do you do first? L: If I don’t forget the idea, I’ll think about it for awhile, then write the first few paragraphs in a notebook. Then I’ll flesh out the characters and come up with some plot points. If I still like the idea, I’ll keep adding on to the story in my notebook. It’s only if I like the idea a lot that I’ll start writing it on the computer. A: I’ll think about it. A lot. Eventually, If I like it enough, sure, I’ll write something down. Maybe just the plot, or one character. Eventually, I’ve learned enough about it that I just have to make it a full novel. What (to you) is the most important thing about writing? L: Believe in your story. Love your characters. Write the story that you want to read. Because if you don’t love your book, why would anyone else? A: Try to write the story your characters and readers deserve. Tell the story God tells you to. L: I never liked writing until I took my first IEW class in third or fourth grade. At first we wrote papers, but them we progressed to a creative writing unit. I loved crafting words and characters, and I sort of took off from there. A: When I was about 6 years old, I realized that the lovely Erin Hunter team… their job was making up stories about animals. I was hooked. I wrote a story, then another, then another. L: Just because I enjoyed it, really. It was a hobby. A: Because I… well, I wanted to. Did anyone encourage you when you started writing? L: Well, there was my IEW teacher and my mom. And then my best friends got into writing, and we encouraged each other. A: My friends, my mom and dad, my grandparents, and my family’s pediatrician. Have you ever felt like you don’t wanna write some days? L: YES. All the time. When that happens, I read over what I’ve already written and edit. That usually gets me going. A: Like, maybe, every other day? Do you like to write stories, or poems better? L: Stories. I’m really no good at poetry. L: Well, no, but that doesn’t stop me from daydreaming and writing about them. A: Hmm… not exactly, I’d just like to. That won’t stop me from dreaming, though. Have you ever met a tan Telepathic unicorn with a dark brown mane and tail and blue eyes with specks of orange named Cody? L: H-how did you know?! A: Why?! Is he yours?! Um, have you ever written a novel? L: I’ve never completed one of my novels, but I’m getting there. A: Yes, but they’re not fully edited yet. I hate editing. Have you tried ‘Write or Die’ before? L: Um, no. I’ve never even heard of it, actually. A: What is that?! Will it kill me if I fail? What’s your favorite uncommon girl’s name? L: My name. Duh. *flips hair* JK, I like Amara, Xena, Calista, Fae, and Azalea. Would you rather ride a purple sparkly unicorn or fly a brown Pegasus? L: idk, I’m not very good at trying new foods. Actually (though I guess this isn’t very strange), potato candy is good. A: Uh… Uh……. I think bananas are pretty strange. They’re long and yellow. How do you manage to die so often? L: THE FEELS. THE FANGIRL FEELS. A: BECAUSE I AM A WRITER; BECAUSE I AM A FANGIRL; BECAUSE THERE IS SO MUCH TO DIE OVER! L: *puts on glasses* *cracks knuckles* The blue cats are superior to the green cats because of the color of their coat; blue beats green, and that’s a fact. However, orange is the color of Camp Half-Blood shirts, making the orange cats greater than even the blue felines. And that is why they rule over Cupcake Mountain. A: The blue cats are better than the green cats because blue is the color of Ravenclaw and green is that of Slytherin, and Ravenclaw is way better than Slytherin. However, orange is the color of Camp Half-Blood and creamsicle, which makes it even better. Thus, orange rules over the Mountain of Cupcakes. Do you have a favorite joke or riddle? 1. Q: Donald Trump and Hilary Clinton are in a plane, but it crashes. Who survives? A: America. 2. Have you heard about the movie Constipation? It never came out. 3. Q: Why can’t Sally stay on the swing? A: She has no arms. 1. I’d love to make a Star Wars pun, but I wouldn’t wanna force it. 2. Han Solo goes back in time and sees his younger self. Then you have a Han Duet. 3. Knock knock knock knock knock. Who’s there? General Grievous. Do you make puns often? L:Yeah. They’re not very good puns, but I say them anyway. 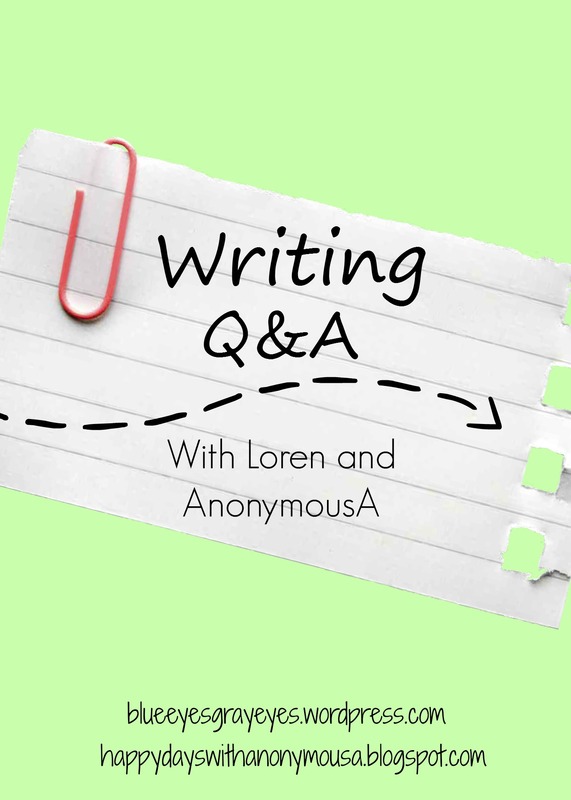 Writing Q&A With AnonymousA — Ask Questions Now! Taken from AA’s blog and slightly modified . . .
AnonymousA and I are doing a Q&A post swap! We need you guys to comment your questions about writing on my blog or AA’s. When we feel like we have enough, we’ll each do a guest post on the other’s blog. You can ask questions about our specific writings or just questions about writing in general. You can ask about writing camps, prompts, NaNo, anything. We’re excited to share our thoughts and tips with you! As Josie put it, “Different worlds mean different people who live in them.” In our world, not everyone looks alike, and in your world, the inhabitants shouldn’t all look the same, either (unless that’s an important part of the story, of course). Think about it: there are many types of people in the world, and they all look so different from each other. They all have unique traits that make them stand out from the rest of Earth’s inhabitants. One of the perks of writing: creating places that can’t exist in real life. You can create a world were it snows all the time (like Narnia in The Lion, the Witch, and the Wardrobe), or a city on the bottom of the ocean. Give your locations memorable names and a fascinating landmark or two, and make the inhabitants unique, like I mentioned in point one. Every country has it’s own cultures and customs. Your fantasy world shouldn’t be any different! Try looking up different cultures or traditions and tweaking them to fit your story. Magic plays a huge part in many fantasy stories. Let’s say that in your world, everyone is born with an elemental power. How does this effect the citizens’ daily life? Do they have classes at school dedicated to mastering their powers? Are people separated into districts according to what power they have? Without a government, your fantasy world will fall into disarray. The most common type of government in fantasy stories is monarchy, which means that a king or queen rules over the land. You know what that means: princesses! But there are many different types of fascinating governments, like oligarchy, dictatorship, etc., which could help shape your world. Make sure to check out Josie’s part HERE. What do you keep in mind when creating a fantasy world? Share your tips in the comments!